Each barrette is hand-made by me. Careful attentions is given at every stage of the process to ensure that the end product is the best that I can offer. 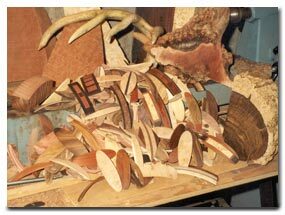 This originates in selecting the finest woods, letting the wood season for a couple of months, slicing the barrette blanks and letting them season as well for a couple of months. I usually purchase my wood a year in advance. I have pieces of Snakewood and Black Palm, to name a couple, that are going through their fourth year of seasoning.... It's a dedication that has many rewards.... my barrettes are not mass-produced. The barrette blank is then given an oval, rectangular or other shape and allowed to relieve any internal stresses that my be incurred by the new surroundings. These stages are embarked upon to stabilize the wood prior to attaching the barrette hardware. This is the most secretive part about the manufacturing process implemented in the barrette products that can be purchase from me. Adhering metal to wood can be extremely trivial or one of the most challenging aspects of a project... It all depends upon what one desires. Some common techniques/materials that are employed to accomplish this task are screws, epoxy and hot glue. They all have their advantages and disadvantages. Products contained in this web page go through a clamping process that consists of a five-stage adhesion technique. This technique was developed over the past four years and I am quite proud to offer it in my product line (Only two returned products to date... they were promptly fixed and returned). Each item is sanded and burnished to bring out the woods true beauty. After sanding 120, 220, 320, 400, 600 and 1500 grits, the items are burnished. Burnishing is a technique where the wood dust of the item being made is used to sand itself. Ultimately the wood cannot scratch itself; therefore, the finished product is exceptional in appearance. One of the most striking and intriguing aspects about wood is the depth to which light can penetrate. This varies from wood to wood and burnishing optimized this. After burnishing, a few applications of Tung Oil seals and protects the product. This gives the barrette an exquisite satin appearance. Standard gravity casting is employed in the manufacturing technique. After buffing, each item is given a rich antiquated appearance with BarretteBaron.Com's unique four-stage process. The pewter used by BarretteBaron.Com is lead free.